Photographer Joseph O. Holmes, a chronicler of people and their work spaces, turned his attention in late 2011 to the film projection booth, capturing projectionists in movie theaters in New York City, Long Island, Connecticut and Pennsylvania. These photos shine a light on what is quickly becoming a lost art form; they reveal the intricate beauty of the projectors and related ephemera such as canisters, reels, and the medium-celluloid itself-scattered across the often cramped booths. Usually anonymous and unseen, the skilled technicians who operate these increasingly rare machines are present in many of the images; their personalities evident in the handwritten notes, personal photographs, and posters that cover any available wall space. 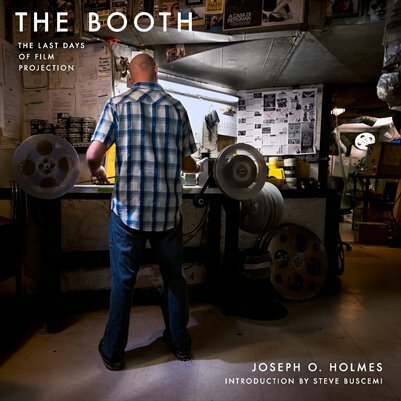 “Joseph Holmes's intimate portraits preserve a visual record of the people who devote their lives to the craft….and preserve the unique working environment of the booth, with all its gadgets and machinery.” - Museum of the Moving Image Chief Curator David Schwartz.